The Union Public Service Commission (UPSC) has invited eligible candidates to apply for the Limited Departmental Competitive Examination to fill the post of assistant commandants (executive) with the Central Industrial Security Force (CISF). The recruitment exam dates are yet to be announced. 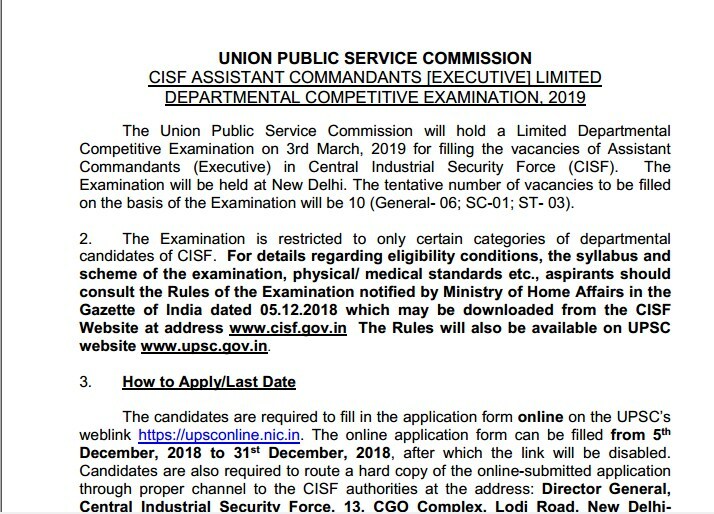 In the previous notification released in April 2018, UPSC had released 398 vacancies. Candidates need to be graduates from a government recognised university, institute or college. It is preferred if candidates have an NCC ‘B’ or ‘C’ certificate as these will be considered during the interview or personality test round. However, this is not a compulsory qualification. Only three attempts are allowed for each eligible candidate. Age limit: Candidate must be under 35 years on August 1, 2019. There is a relaxation of five years for the candidates belonging to SC/ST category. Work Experience: The candidates should have four years of work experience including basic training period on January 1, 2019 in the rank of Sub-inspector (GD) or Inspector (GD). channel to the CISF authorities at the address: Director General, Central Industrial Security Force, 13, CGO Complex, Lodi Road, New Delhi-110003, for verification and onward transmission to the Commission. Application fees: Candidates have to pay a fee of Rs 200. Female/SC/ST candidates are exempted from payment of fee. e-Admission Certificates of the admitted candidates to this examination will be uploaded in the UPSC website www.upsc.gov.in two weeks before the date of examination and can be downloaded by the eligible candidates. No paper Admission Certificate will be issued by the Commission. The Online Applications can be filled up to 31st December, 2018 till 6:00 P.M. after which link will be disabled. The last date for receiving printed copy (hard copy) of online application form along with enclosures/certificates is 8th January, 2019, by CISF authority for further verification and forwarding the same to the Commission. The written exam will be of 300 marks constituting 150 questions. Candidates will be given two and a half hours to complete the exam. The written exam will be multiple choice question (MCQ) based. The exam will be bilingual and be set in both English and Hindi. The paper will be divided into two parts. Part one is further divided into two parts comprising of general ability and intelligence questions for 150 marks and professional skills test for 150 marks. There will be 75 question in each section. Part two will comprise of an essay, precis writing and comprehension for 100 marks for two hours. A candidate will be given choice to attempt the written part in either Hindi or English.